Kaphajanya premeha: Kapha which gets vitiated ( increased) and localized in the urinary bladder, produces prameha by vitiating the kleda (body fluid), sweda (sweat), meda (fat), rasa (plasma) & mamsa (muscle). Pittjanya premeha: Even pitta & raktha (blood) also produce prameha, by vitiating the urinary bladder when kleda (body fluid), sweda (sweat), meda (fat), rasa (plasma) & mamsa (muscle) are depleted. Vatajanya premeha: Even vata also causes prameha, by dragging the dhatus – kleda (body fluid), sweda (sweat), meda (fat), rasa (plasma) & mamsa (muscle) into the bladder when they are depleted. The aggravation of vata is caused by – dahtukshaya (depletion of tissues) and obstruction of its path/movement by the dosha covering it. HbA1c is a test that evaluates the long term concentration of glucose in the blood. Red blood cells (RBC) contain a small amount of glucose. When there is more quantity of glucose in the blood for a longer period of time, this causes the RBC glucose or HbA1c levels to increase. For instance, if a high sugar meal is consumed only once, it will not affect the HbA1c levels. However, if a patient continuously consumes a high sugar or unhealthy diet along with lack of exercise for up to 6 – 8 weeks, then the HbA1c levels rises. This test is helpful in understanding a patient’s control of their blood glucose levels as well as those who are likely to develop complications of diabetes. > 8.0 – Poor Control Diabetic. Most likely already has a complication of diabetes. While in the case of emaciated & weak patients, shamana chikitsa (palliative therapy) in the form of santarpana (rejuvenation/nourishing) should be administered. Medications have all been claimed to be curative value in the literature. 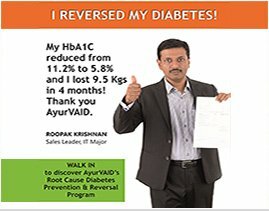 Diabetes Mellitus can not be cured, but it can be successfully managed with proper diet, physical activities and medication if needed. Some may claim that they can cure diabetes through a variety of methods, however once a patient is diagnosed as diabetic; they will always have to monitor their blood glucose levels. Many patients have a very healthy and long life with well controlled diabetes.